If I could have any painting by anyone, it would be this one. 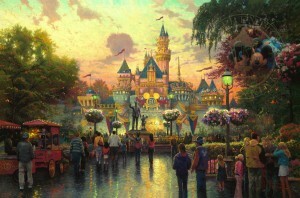 I love Thomas Kinkade’s work and Disneyland is my favorite place. I was at the 50th anniversary. It was an amazing experience. Me and my family took a picture in front of the castle that looks just like this! We were even there for their 50th Anniversary! It is an absolutely gorgeous painting! I was there for the Grand Opening in 1955, with my parents and two older sisters.I was 6 yrs old and can still remember my Mother wearing a pink dress and matching high heels,my Dad dressed nice as well, and us girls in dresses. The excitement of seeing something so different,and amazing and so close to my home (we lived in Garden Grove,Ca was thrilling to a little girl. It still is one of my favorite places to go and one of my favorite memories.This would be a wonderful painting to add to the two that we have in our home. This artwork is so amazing! 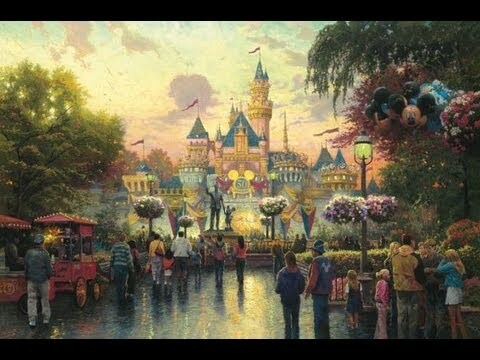 We were fortunate enough to purchase this painting at Disneyland’s 50th Anniversary and have Thomas Kincaid sign the back! Our family have many happy memories together at Disneyland and this painting is a reminder of those fun times together. Love Thomas Kincaids artwork! He left this world too soon, but, his paintings will remind us of the beauty there is around us.